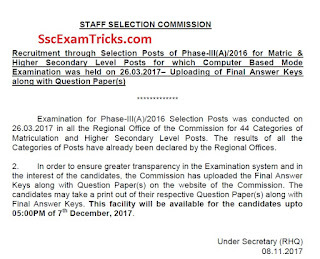 SSC CHSL Typing Test Admit Card 2017 Download SSC CHSL Skill Test Call Letter – Check Staff Selection Commission Hall Tickets for Skill Test/ Typing Test Download at www.ssc.nic.in. The good news is that SSC has uploaded typing test admit card now on the official website www.ssc.nic.in. The typing test/ skill test has been scheduled to be held from 21st November to 19th December 2017 at various exam centres. Now the admit card has been available now which can be downloaded from the link given here.
."Click here to download Admission Certificate for Higher Secondary Level (Selection Post) Exam, 2017 to be held on 15.11.2017". The news is that SSC has uploaded answer keys for written test scheduled on 26th March 2017. SSC LDC Tier III (Skill test/ Typing test) typing test will be scheduled soon and to be updated very shortly here. The final answer keys can be downloaded from the link activated on the website. The good news is that SSC is ready to declare the date for typing test which is expected to be held in November 2017. The final date for typing test will be announced soon. The scorecard of SSC CHSL Paper II 2017 will be uploaded shortly on www.ssc.nic.in. This typing test will be done on computer. Nature of the typing test will be qualifying only. Typing test can be given in English or Hindi languages. 35 w.p.m. and 30 w.p.m. corresponds to 10500 Key Depressions Per Hour/ 9000Key Depressions Per Hour respectively. The good news is that SSC has released online admit card for CHSL Document verification which has been schedule after SSC CHSL LDC Typing test. The candidates who are waiting for their online admit card for document verification can download it from direct link given here. Latest Updates: The SSC Admit card for Skill Test has been available on all regional website of the commission. The skill test is going to be held in November / December 2017. Latest Updates: The following instructions are given for examination about SSC CHSL Admit card 2016. The SSC online admit card is valid with photo id proof like PAN card, driving license, Voter card ID etc. Late coming candidates will not be allowed to attend written exam. Follow all instructions of written exam given on the notice board of examination hall and also mentioned in Staff Selection Commission Hall Ticket. DEO Data Entry Skill Test Exam Pattern: The skill test will be organized for DEO posts. SSC Call Letter and CHSL Exam Pattern: The SSC CHSL Skill Test will be organized on computer. The typing speed must be equal or above 35 w.p.m. in English typing and 30 w.p.m. in Hindi typing corresponding to 10500 key depressions per hour/ 9000 key depressions per hour respectively. A set of paragraph will be given as hard copy and asks for typing the same in 10 minutes to evaluate typing speed of the candidates. 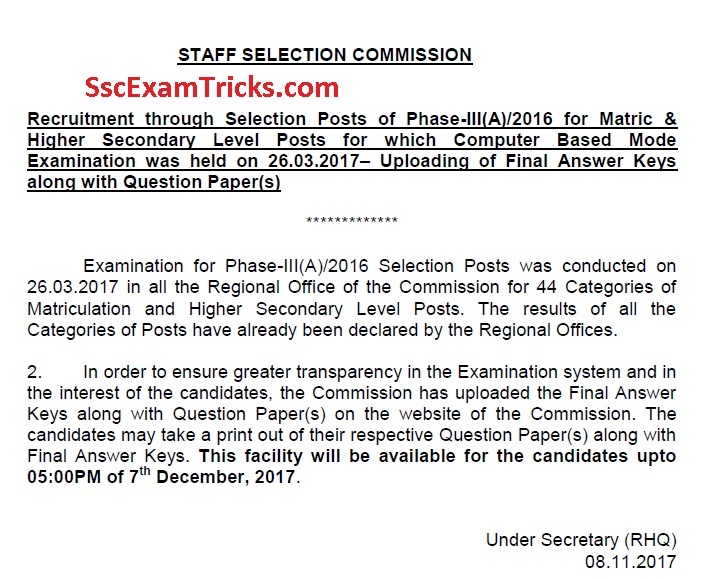 In case of tie for final selection, the resolution will be taken by considering priority of written test (1st), date of birth (2nd) and alphabet order of name of select candidates. The descriptive exam will be organized on 18th September 2016. The descriptive (Paper II) will be of 100 marks. Earlier SSC had conducted objective test in November and December 2016 held for 30, 44, 455 candidates had appeared in which about a total of 60,975 candidates have qualified and are going to attend descriptive examination. The SSC Exam Admit Card will be issued 10-15 days before the exam date. The best process to download Admit card of SSC is discussed here. Ensure your registration number and date of birth prior to download your SSC online admit card. Click on the direct link mentioned in the end of the page and provides these details on the official page. Press ‘Submit’ button and SSC CHSL DEO Typing Test Admit Card 2017 or SSC CHSL Document Verification Call Letter 2017 for LDC PA SA download call letters for SSC CHSL Exam 2017.